The cats we had before moved around freely in the garden and in the streets. We did not like them going into our neighbours’ garden regularly at all, but once they are used to going outside it is not easy to keep them in the house all the time. We had already taught Nero to stay in our garden, with all kinds of toys and with wire netting on the fence so that he could not climb over it. 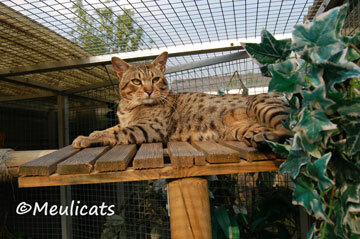 When we got Spot however, things became very different; he is a very atletic cat that could easily jump on the fence. First we bought him a neckband and we put a peg in the ground with a very long rope attached to it so that he could walk around in the garden. 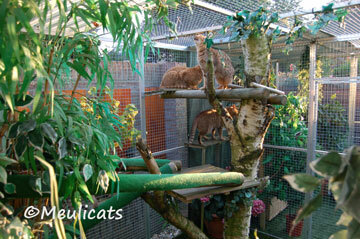 This was no success, all kittens are very curious, but Ocicats beat the lot! What next? In the cattery Goobita Yangatin they had a very nice cat-run. We asked by whom this was made and we got the name of Ja-ni in Oss (specialized in cages and runs). There we ordered our cat-run. July 2003, we made a concept plan with for a run sized 2 x 3 meter and we sent it to Ja-ni. 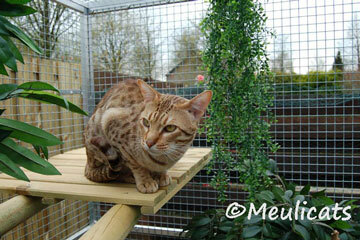 He made the aluminium panels and we built our cat-run. We put false grass on the floor and we made several shelves for the cats to sit on. Now we are looking for a tree-trunk to complete it. 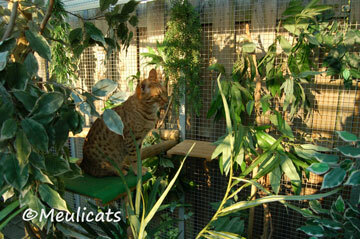 February 2004, we put several artificial plants as decoration in the run. September 2004, it was still not perfect: the cats should be able to go directly from the house into the run, so we enlarged the run and made a passage from the pantry to and form the shed into the run. 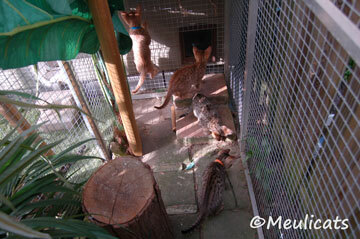 After this operation the passages were ready and the cats could go outside whenever they wanted. They looked very surprised and we are still very sorry that we did not take pictures the first time they went outside. 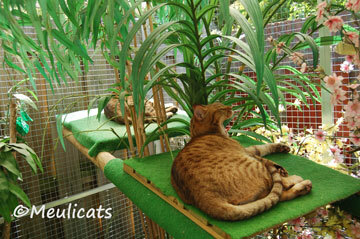 March 2007: We also made a separate catrun for Wizard our stud. He likes it so much to play an sleep in the garden. There is room to shelter from the rain and a lot of leaves to hide. 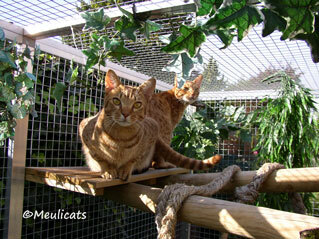 March 2008................ we enlarge the catrun again. We have built a new garden house for our stud. 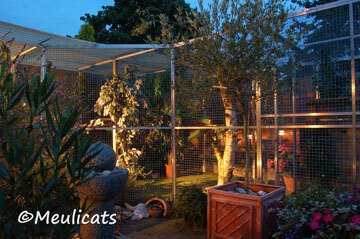 In summertime our stud can live here and it is possible go in and out in the catrun whenever he wants. We put also some spotlights in it. The kittens like it also to play and run outside there is alway something to discover and they can climb and be a little naughty.